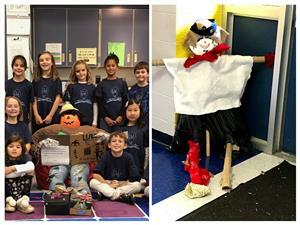 George Washington students enjoyed participating in a fall class project for October Spirit Day. Each class was asked to "reinvent the scarecrow". The classes were given a few supplies to start with. as well as, the use of Makerspace. The rest was up to them. "BOY OH BOY" did their imaginations run wild. The classes created wonderfully creative results. FUN! TEAMWORK! INNOVATION!